Parenting is never exhausting and I’m never ready to go to bed at 6pm. Cue the laughter. We all know taking care of kids, managing a house, and the rest of life isn’t easy. “The days are long but the years are short”. Countless times we’ve heard and read those words. Moms and grandmas that have been there before encourage us not to let the days pass by and to cherish the moments with our littles. We hear how they miss those moments when their children were little. It’s true. We know it. The days seem long yet our children grow so quickly. We want to savor and enjoy the time we have with them. It doesn’t change the fact, though, that It’s hard. It’s exhausting. When month after month you are waking up multiple times through the night with a crying baby or toddler. Then there is a clingy, drooling child wanting you throughout the day. A toddler is pushing her limits, testing you to see what she can get by with. Then there are the normal tasks of diaper changing, bottom wiping, laundry washing, nursing, making meals and (minimal) cleaning. Life is overwhelming. It’s hard to appreciate what you have when you are exhausted and have a to-do list a mile long. 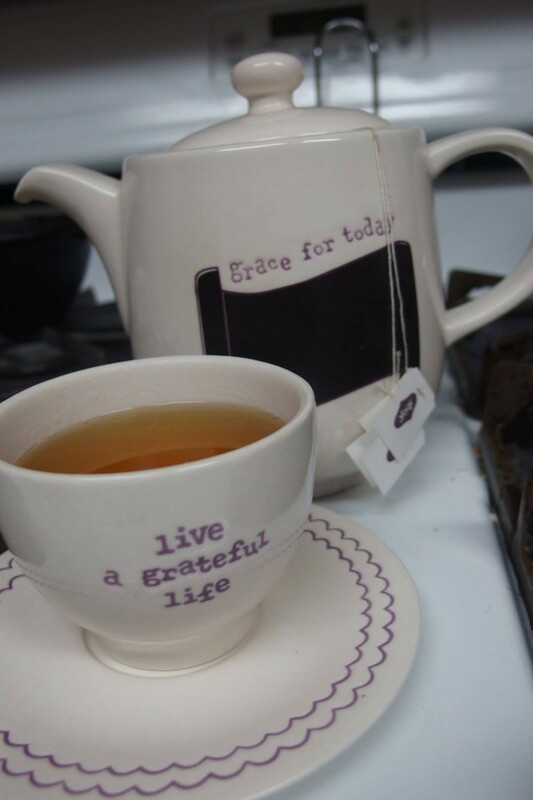 I want to share with you 12 suggestions for helping us to enjoy life when the days are long. At the end of one of those chaotic and exhausting days, there is nothing like relaxing in the shower. It helps relieve stress and clear my brain. If you take a bath, add an Oatmeal Lavender Bath Tea Bag for added moisture and relaxation! A little secret indulgence to look forward to. Sometimes a piece of dark chocolate makes everything look better. Or make a batch of fudge and put it in the freezer! Tell God what you are going through. Ask Him to help you. Take praying without ceasing to heart. When you are stressing or don’t know if you can follow through with your child another time, whisper a prayer to Him. Sometimes breaking up the routine does wonders for attitudes and helps you enjoy the small moments with you children. On long days where there seems to be continual drama, I’ve been known to put the kids in the tub for an afternoon bath. They love baths so this always makes them happy. The water is cold long before they want to get out. I can also spend some time reading while I sit and watch them so it’s a win win. Maybe turning your lunch into a picnic on the living room floor or taking an impromptu trip to the park will enable you to leave your to-do list behind for an hour and enjoy making a memory with your children. This is a great one for when the weather is nice. Even if it’s less than desirable, you can bundle everyone up and keep it short. Exercise and being outside typically helps the moods in my family. It’s a great way to blow steam, burn energy, and get rid of some stress. If your kids are stroller age, you will get a good workout in. If they are older, let them walk or bike down the sidewalk and burn off some of their energy. Don’t make movies and television a normal part of your routine. Keep them special. Then when the kids are being especially clingy, under the weather, or you have a project that really needs to be done you can put in a movie and they will be excited. Coffee is not my thing, but I love a good cup of hot tea. Yogi Egyptian Licorice is one of my favorites and it’s fun to buy a box of a new one to try every once in a while. I brew myself a cup to sip on during the day. Sure it might need reheated a time or two, but there is just something relaxing about a hot drink. Don’t think you can (or even have to) do it all. Realize a perfectly tidy house isn’t realistic. Know your child will misbehave on occasions. Don’t compare yourself to others. Stuff and clutter cause more stress in my life. I know I won’t eliminate it, but I can decrease it. A 5 minute pick-up has made a huge difference in our home. I feel so much better after we are done. Don’t try and be fancy and creative. (Unless it’s something that makes you excited.) Your kids won’t know the difference. Don’t put pressure on yourself for big birthday parties, gourmet meals, and extra curricular activities you feel pressured to do. Simplify and just do what is right for your family at this time. 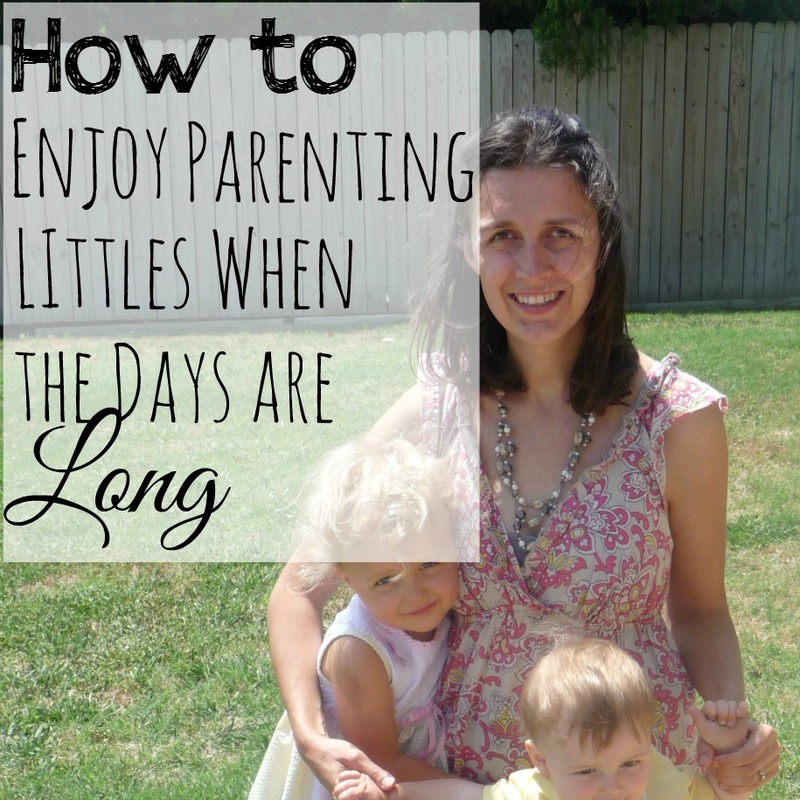 What ways have you found to help you enjoy the everyday moments with your children when the days are long? If your children are grown, what advice do you have for those of us in the midst of it? This entry was posted in Family, Uncategorized on March 18, 2015 by Deanna Michaels. These are such good suggestions! I love my hot, long shower at the end of the day. It’s my small splurge…since I know it’s not very frugal. 🙂 But it’s my time to destress and wind down. Another thing that I’ve found helpful is to do little things to add some joy to my day. Simple things like burning a candle, playing my favorite CD, buying an inexpensive bouquet of fresh flowers….things like that help keep my spirit refreshed! 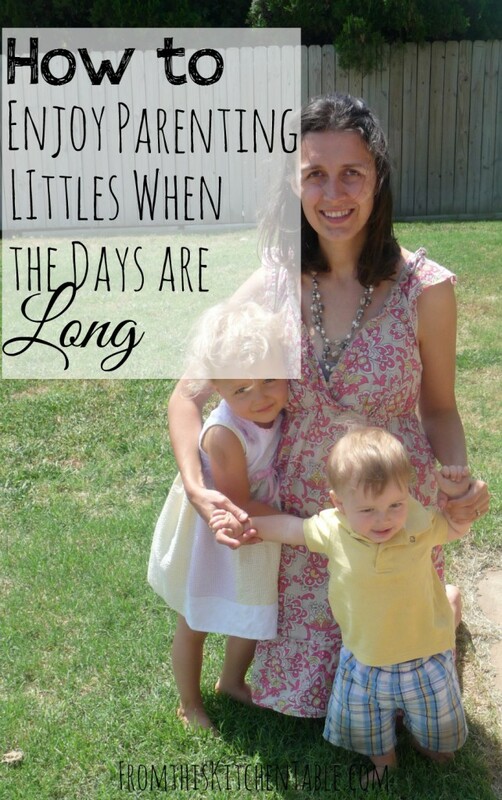 Thanks for sharing this….being in the trenches of mothering little ones is hard! Yes! Showers are such a great destresser! Love the candle. I have a few, but they never get burned. I need to start doing that. And I have CDs and podcasts I enjoy, but never start them. I need to do better about that. They’d keep me in a better mood and probably the kids too. 🙂 Thanks for your comment! Thank you for sharing this, it is nice to know I am not alone. Trying to parent and keep a tidy house, and bond with our kids, is so exhausting. We just have to remind ourselves, sometimes, that it is one of the most rewarding (but hardest) jobs we will ever have. I realized one day that I was spending too much time “sleeping in” and getting up just in time to get ready. I had to make myself change into a night-time bather (showerer just didn’t look right) and an earlier riser. This has helped me tackle more stuff in the morning before the kids are up, rather than staying up way too late and getting it all done at night. I also have a nighttime tidy routine too, it’s a bit more than 5 minutes, but I hate cleaning and like to dawdle more than I should, but I feel so much better when the house is at least half neat! It is so nice to know we are not along! It is exhausting. I think you are right, it is the most rewarding (and important) job we will have. Love how you’ve gotten up earlier to have more time before they kids are up. I know that makes a difference for me when I have even 30 minutes before they are up. Eventually I’ll need to prioritize getting up early more. I’m waiting for my (too old) youngest to start sleeping through the night. . . I know what you mean, my one year old still has times when she won’t sleep through the night, I got up at 5:30 the other morning, but so did she. Then last night, she decided her bedtime was at 9:30 pm. I tried, believe me I tried, but all she wanted to do was play (or scream if she wasn’t playing). They are exhausting! 🙂 They know what they want (or don’t want) and let us know! Spencer will be 2 in May and the sleep thing is still a struggle. But I think we are making progress. . . It seems like more often now we are doing just once a night. I’m hoping by the time he’s two! Great ideas! I read this while taking a minute to put my feet up while surrounded by my 3 boys and foster daughter 😉 I definitely can relate to being ready for bedtime… at lunchtime… I think taking some time for ourselves and learning to enjoy the mundane things that feed our souls like a cup of tea or coffee is huge. I’m so thankful for each of our little blessings and, like you, don’t want to just “get through” these years. The small victories definitely help- just last week our 3 year old accepted Christ, though that was such a big one that I’ve been smiling for days! So glad you shared! You are a busy lady! Way to go for putting your feet up for a couple minutes. I love when they play outside and I can sit on the swing and read. 🙂 Yay on your 3 year old! That’s soooo exciting. I think I’ve used most of these techniques at one time or another. I’ve also taught my children how to sit quietly and look at/read a book for ten to fifteen minutes. Now that they are fluent readers this is not an issue, but getting them to do this really helped to quiet them down when things got chaotic. I agree with these. I find myself telling my kids too often that they need to stop growing so quickly. Instead I should enjoy now and not wish they were younger. 🙂 They are not even in 2nd grade yet, so we still have many years to go, someday I’ll wish they were this age again. Thanks for the encouragement and tips. Awww! Love that you wish they were younger. I do miss the tiny baby cuddles sometime. But I love these ages (2 and 4) – it’s so fun to see them learn and listen to them talk. But it’s hard to keep everything in perspective ha ha. Exactly! We were the same way growing up – we’d get up early no matter what so mom put us down early. I secretly love the days they are down at 7pm. It makes for a nice and quiet evening. Grumpy days are miserable. Agreed that we have to do what it takes to make them not happen – even early bedtimes. Yes to all of these! And seriously, getting kids outside makes EVERYTHING better. Amen! Thank goodness for spring and being able to spend hours outside again! An early bedtime is an absolutely must around here. As is sometimes doing things out of the ordinary. I love this list. Thanks for sharing! Agreed. Early bed times are amazing. I think there is even something about having them in their PJs that immediately helps. 🙂 We’ve been known to do non-messy dinners in PJs. Thanks for stopping by! Thanks for hosting and for featuring!!! a beautifully encouraging list. I had just been feeling bad about the state of the house when I read this. I have a 5 year old and 5 month old and a puppy. Hectic! Thanks, Louisa! That sounds hectic! You are brave adding a puppy into the mix. 🙂 Don’t feel bad! I think the house will never be super clean for more than 2 minutes with littles. My 22 month old’s mission in life is to destroy as much and as often as he can. Hope you have a great weekend!